Club Penguin Cheats by Mimo777 Club Penguin Cheats by Mimo777: Adopt A Club Penguin Orange Puffle Now! Wow, do you like this new puffle? Do you think it is bigger than the other puffles? I'm going to name him Tangerine! I know im in the pet shop right now. I think it does look bigger than the other puffles. It's cool how it has buck teeth! Awesome orange puffle lol look how goofy it looks! I got one I named him Goofy :D Thay dance so cool!!! When they dance thay Hoola Hoop!!! They are sooo cute I'm sooo glad clubpenguin made the orange puffle! Its soooo kool and i <3 the new orange puffle! I've got one. It's name is Zany. actually I got two. Can you get them in the treasure book? You Can Buy 18 puffles not 16 now! IT'S THE BEST PUFFLE EVA!!!!! Like I said, I named him Fred. I love that he's really crazy and I like that it has buck teeth. LOL! Yeah, I noticed in the Pet Shop (over the brown puffle house) that it's pretty big. I love it!!! But I hate they're making lotsa stuff for members. ALL penguins should have the same rights! I want nons to have orange puffles!! P.S. Why didn't they change the Pet Furniture catalog? I want an orange house and bed for my puffle! I monitored CP until it came out! WOOT! I just saw the orange puffle play with a box! Finally! I want 2! My current one is called Mac donald! That's awesome! Too bad it's members only :P Cmon' CP, why can't you make a new puffle for non members too? Lol i named him bubbah because he looks big in the pet shop..is that odd?? Hey Mimo! Doesn't it seem like the orange and white puffles are the babies. Hmmmm, you can adopt puffles in the treasure book. But I think you may be able to adopt them in the soon to come treasure book. I think its number 7. Look out for it. Sorry I'm shouting, I'm just SO ANGRY that Club Penguin never allows non-members to buy new puffles. I LOVE MY ORANGE PUFFLE!!!! her name is clementine! I guess now we know who will mostly be in the April Fools Party. Hey mimo you know what that wagon pin is for? Look in that picture you see the orange puffle in the wagon! 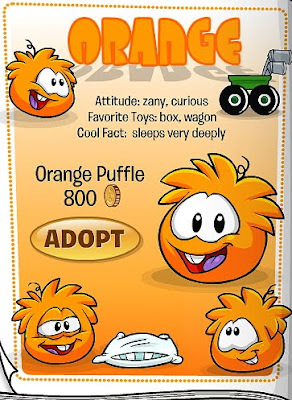 CP should make a game called box racing in the box deminsion and the orange puffle can play it with you. ooh when he dances he hoola hoops and in the pet shop hes real big he must LOVE to eat!! :( the buck teeth ruined it! Wow! The new puffle is awesome! I don't think it's bigger than other puffles though. I think CP were trying to use perspective in the Pet Shop. Anyways, ORANGE PUFFLEZ RULE! Thats Mama Luigi to you, Mario! Puffles will play 2 different ways, when they are super healthy they will play a much cooler way and when they are not as healthy they play a different way. i got one! hes so wacky and awsome thanks mimo i probably wouldent have know about it until 3 weeks from now! lol thanks mimo u rock!!! hmmmm i hope there will be a brown puffle! I have one I called it bubky because of the buck teeth but when I make it play it is always the wagon not the box. Probablly his health/rest is to high up. Also yeah Mimo it does look bigger then to others. Maybe more fur? If you buy one and look at the postcard if you compare it with others it looks way bigger. THE ORANGE PUFFLES HULA HOOP WHEN DANCING! When all the bars are full, it plays with the wagon. When they are not, it uses the box. Yea! he likes to roll in style i guess. :p Pretty awesome! Hey!! Do you think the new elite force game will have the white and orange puffle in ALL the missions? Please tell my theory to all!!!! Thanks. it has buck teeth. LOL! Yeah, I noticed in the Pet Shop (over the brown puffle house) that it's pretty big. I love it!!! But I hate they're making lotsa stuff for members. ALL penguins should have the same rights! I want nons to have orange puffles!! Well, You can't change the puffle catalog too often. But just wait until the next one, I'm sure that'll have exactly what you're looking for. shop hes real big he must LOVE to eat!! Great observation! I can't wait to see it! Gonna get my silly carrot colored cutie today! Not sure on a name yet but I'll think of a good one. i got it i got it! OMG I love when it sleeps it's just like me I LOVE IT I named mine Peach. These puffles are so weird and warped, like you Mimo!! i got a question... does it have a favourite game??? I have one! I named it Citrus! I was in the dance club and a lot of orange penguins or puffles where there and the whole setting changed..... it was like it was an orange dance club!!! IT LOOKED AWESOME!!!! green puffles arch enemy is going to orange puffle!! I got one, their SO cool!!! I love it because it look so crazy and i named it grape fruit because all of my puffles are named after food!! Would be even better if they gave the orange puffle a game to play with you. oh well. Yes I do I lvoe the orange puffle it is zany just like me!!! I got one my self!!! Do you have a orange puffle Mimo? My puffle is named Rafi, he is really cute and wacky! I also think it's super unfair that nons can't adopt these puffles. When the yellow puffle came out I was a non and I was really mad that I couldn't adopt it. CP already does a whole lot for members; it's time to give a shout-out to nons too! I got one! its name is Tropicana! They play with trucks and boxes. When you dance (when walking them) they hula hoop. servers with 1 bar pon people on say they are full. I just seen this. Maybe.They usually don't update it as soon as it comes out. YAAAAY! The ORANGE puffle is sooo cool, I got two and i named them riku and zesty! I am a bit curious as to how you get them to play with the box and I was just wondering mimo...aren't you a bit dissapointed that you can't get an ORANGE puffle because you aren't a member? I am not sure, but you can get them from the pet shop if your a member.The treasure book is new for me lol. Does this mean that once Club Penguin introduces even MORE puffles, non-members will be able to buy the puffles which would then be classified as "Old"? P.S. Old CPG Mod, who ARE you? mimo i saw nonmembers wearing them so you can go get one when i get $800 coins im soo getting an orange puffle! rock on mimo! I have already two puffles, how can I sell them? You can't really sell them sadly, you just don't feed them and they eventually run away. It would be a good idea for club penguin to do that. Has anyone noticed how the yellow puffle has a purple tongue too? 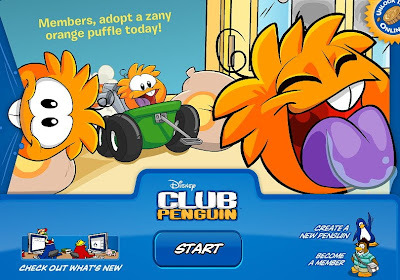 And the orange puffle? I think there might be a connection. I hope my mum will let me be a member during the holidays :) If I act REALLY nice maybe I 'll become a member & buy a orange puffle!! Yeah, the Orange Puffle is a bit bigger than the rest... And the White Puffle is smaller than all the others... Weird, right? I Have An Orange Puffle! does anyone else kinda dislike the orange puffles? Yeah it's bigger I'm pretty sure! I named him Dorito after the crisps!! i got one called tango!!! if u look in the pet shop where the orange puffle is sitting, hes sitting on a BROWN puffle house. might be a clue to the next puffle! the orange puffle isnt on puffle round up. yay finally a puffle in my fave colour! Dang! i just lost my membership so I can't get it! I lost it the day the orange puffle came out! I am so jealous of the people that have one!